"Hasbro worked closely with both Rovio and Lucasfilm to deliver a fully integrated TELEPODS experience with the new ANGRY BIRDS STAR WARS II app. 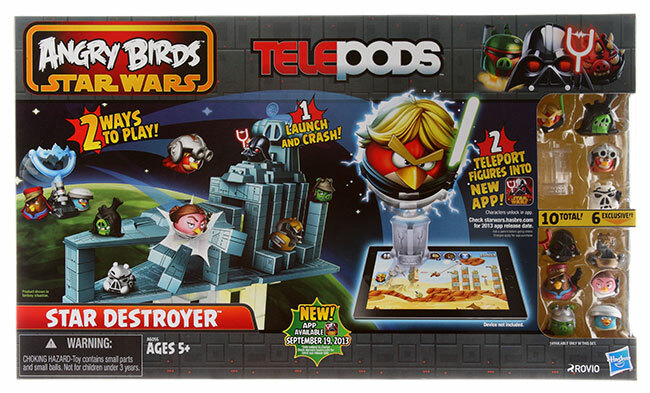 Now kids and fans can enjoy unprecedented and seamless dual play in both physical and digital ANGRY BIRDS experiences," said John Frascotti, Chief Marketing Officer, Hasbro, Inc. "TELEPODS represents a remarkable new way for consumers to play with Hasbro's incredible portfolio of brands." To ensure that the TELEPODS platform and experience was accurately and fully integrated into the new ANGRY BIRDS STAR WARS II game, Hasbro's Star Wars design team spent time at Rovio's headquarters in Finland, working side by side with the game designers. "There has never been a digital/toy team like this before, and it's indicative of the true dual-play opportunity that the TELEPODS platform provides," said Frascotti. "Angry Birds Star Wars was a blockbuster hit for us and Lucasfilm with over 100 million downloads since its release. We are thrilled to be able to introduce the exciting next chapter in the Angry Birds Star Wars saga to our fans around the world," said Jami Laes, Executive Vice President of Games at Rovio Entertainment. "Some of the most amazing character additions are the bird versions of young Anakin, Mace Windu and Darth Maul. The TELEPODS line from Hasbro provides a great way to bring a whole new dimension to the gameplay for kids and families, magically bringing the digital and physical gameplay experiences together." For the first time ever, Telepods lets players teleport Rebel Bird and Imperial Pig figures into the new Angry Birds Star Wars II app so they can choose which characters to launch. Following the release of Angry Birds Star Wars II, fans will be able to download the app, tap the Telepods icon in the app, place one of the more than 30 ANGRY BIRDS STAR WARS figures on the included TELEPODS base, and then place the base on a smart device (not included) to immediately "teleport" that figure into the game. TELEPODS are also the first digitally integrated toys designed with stand-alone playability in mind. An assortment of play sets will invite kids to launch their Rebel Bird figures in real life to destroy iconic Angry Birds Star Wars structures and topple the evil Pig Empire. ANGRY BIRDS STAR WARS II will follow the story of the three prequel Star Wars movies. With the introduction of never seen before Angry Birds Star Wars characters, the player can for the first time in the history of Angry Birds choose to take the "Pork Side" and play as one of the green pigs. Angry Birds Star Wars II will be available in app stores worldwide on September 19th. Every copy of ANGRY BIRDS STAR WARS II will include a "TELEPODS" mode that allows users of smart devices with front-facing cameras to "teleport" their ANGRY BIRDS STAR WARS TELEPODS figures into the game and, for the first time in ANGRY BIRDS history, choose which characters they want to use to complete a level. The TELEPODS line from Hasbro will arrive in retail in September along with the game, and will be presented at Comic-Con International in San Diego, July 17-21.